Mexico, Mo (February 2011) - Recently, refining and recycling companies have questioned the definition of X-ray destruction in accordance with the HITECH bill passed a year ago in order to remain compliant with government regulations. In particular the topic of whether or not X-ray shredding was required was under question. Healthcare organizations reported to Arch Enterprises that some companies were mistakenly reporting that shredding was necessary in order to fully destroy the materials. As a result, hospital and healthcare organizations were spending extra money on this service when it turned out to be unnecessary. Arch Enterprises recently reviewed the policies set forth in the HITECH bill, and according to the rules and regulations set forth by the Health Insurance Portability and Accountability Act (HIPAA) and the Health Information Technology for Economic and Clinical Health Act (HITECH), X-ray film must be destroyed in a manner to where it cannot be reconstructed. While some recycling companies do shred the X-ray film, precious metal refiners that recover silver do not have to shred it during the refining process. "Many healthcare facilities that have X-ray film are now more concerned about the specifics of the destruction regulations since the government issued the HITECH Act," said Stacy Slater, national sales manager for Arch Enterprises. "The HITECH Act actually has very little to do with the X-ray film that precious metal refineries handle. It is more about how hospitals and clinics handle their digital patient information. As long as the X-ray film and patient information is destroyed in a manner to which it cannot be reconstructed and you receive all the necessary documentation of destruction, you are in compliance with the law. Companies like Arch Enterprises destroy the X-ray film according to HIPAA regulations and refines the silver from the film without the added step of shredding the materials." Hospitals and clinics follow their own state and internal rules and regulations for X-ray storing and removal. However, organizations need to secure refiners that abide by the laws set by HIPAA and HITECH for X-ray refining and destruction. X-ray film needs to be handled in a timely manner and kept under lock-and-key. Refiners then present Certificates of Destruction confirming that the proper process was taken to destroy this sensitive information. The companies also should offer documentation of general liability and environmental insurance policies. While shredding and refining are both destructive processes, companies like Arch Enterprises use a refining technique to recover the silver from the X-ray film and gives returns based on the amount of silver recovered. "It is our business to keep up-to-date on all laws concerning X-ray film destruction. Most likely, shredding companies will destroy the X-ray film either for free or for a fee and then have it refined in large amounts. 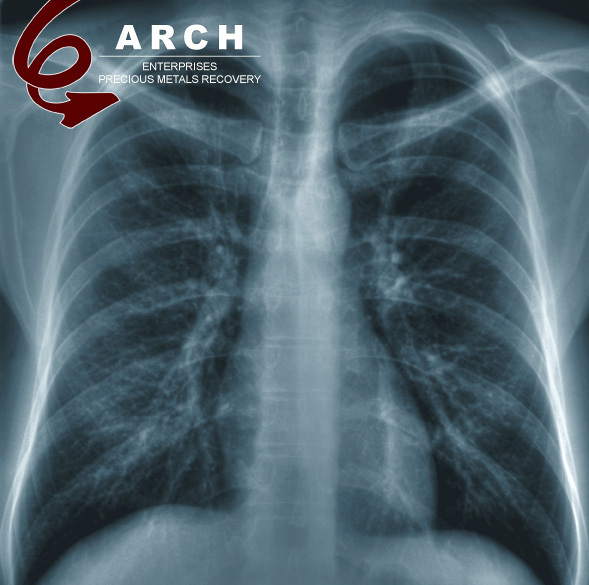 Eight of the top 100 hospitals in the country work directly with Arch Enterprises for X-ray film destruction and silver recovery and enjoy the benefits of working directly with a refiner while remaining compliant in their X-ray destruction processes. Our experienced team takes every precaution necessary to ensure that the X-ray materials are disposed in accordance to government regulations and in an environmentally friendly manner," said Slater. Arch Enterprises maintains an A+ rating by the Better Business Bureau and is affiliated with several professional associations including the National Association for Information Destruction (NAID) and the National Association of Dental Laboratories (NADL). The company provides X-ray refining services nationwide and can help arrange freight for large shipments. Arch also performs on-site purging of X-ray film in eight states including Alabama, Northern Florida, Illinois, Iowa, Kansas, Missouri, Oklahoma and Tennessee. More information about X-ray recycling and disposal or X-ray film refining estimates can be requested by calling 1-800-835-0478 or by visiting http://www.archenterprises.com.